Located in Venezuela’s Canaima National Park in South America, Mount Roraima is the tallest of the tepui plateaus that make up the Pakaraima chain. The peak marks the point that acts as a triple border between Venezuela, Guyana, and Brazil. The park’s mountains are thought to be amongst the most ancient geological formations in the world, some dating all the way back 2 billion years to the Precambrian period. Mount Roraima was first described by Sir Walter Raleigh during his 1595 expedition to try and find the fabled golden city of El Dorado. The stunning view from its vistas and the stark and striking landscape that surrounds it has meant that it has long been a favored location for mountaineers, photographers, and adventurers alike. Due to its isolated location, the park as well as mountain itself are both home to some unique and interesting fauna and flora. The extremely rarely seen Rapatea heather and Heliamphora plants can both be found at the summit. It rains here almost the entire year and due to the flat surface on the plateau, this causes random waterfalls to begin cascading down the mountain. The tallest waterfall in the world, Angel Falls, is located relatively nearby and is in the same national park; another point of interest for anyone who's thinking of making the trip. Ascending the mountain’s steep face is no easy task and it wasn’t until 1884 that this feat was first achieved. Everard Thurn trekked up a trail on the Venezuelan side that follows a sort of natural staircase and is the only “easy” way up. There are other methods of ascent, but these routes require technical rock climbing experience. The best time to visit the mountain is in the dry season between December and April. It should be noted that although it is the driest time to visit, it is far from actually dry and heavy rainfall still occurs regularly. The weather is moody and can switch incredibly quickly, but fog, mist, and rain are constant. To get to the mountain the best way is to fly into Santa Elena De Uairen airport. You will likely need to take a transfer flight as it is not served from most major cities. From this small town in Brazil, lying close to the border, you can then take a bus or shuttle to the ascending point: The Pemón village of Paraitepui. It is advised that you make the journey with a guide from the village for although the trail is fairly well marked, the constant fog and cloud cover can make getting lost atop the mountain far too easy. 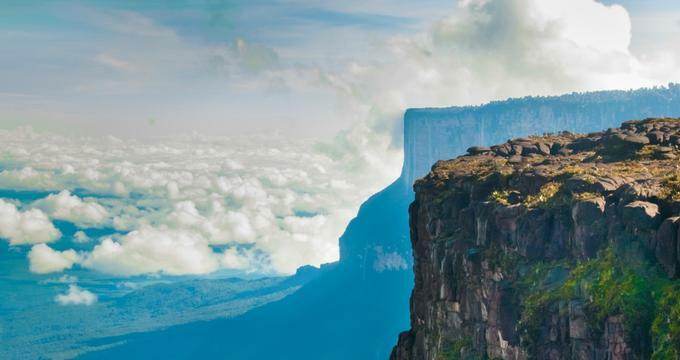 Another thing to remember is that, as with anywhere else in Canaima National Park, removing any plants or rocks from the mountain is strictly prohibited.